The Williamsport Community Band was first organized in August 1927 with over 40 members. The band performed concerts and played for many community events. In June 1928, the band had the honor of being the official band for the Maryland Delegation at the Democratic Convention held in Houston TX. The number of years the band continued to perform is not documented. 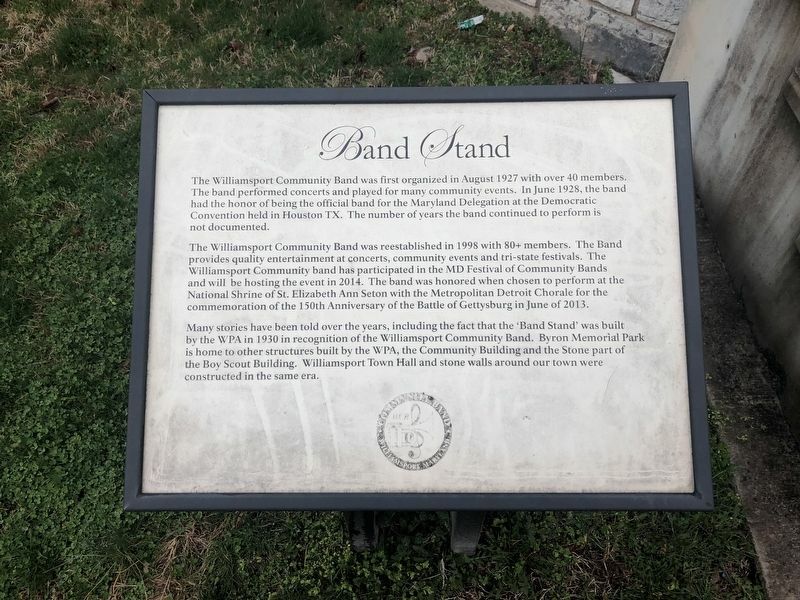 The Williamsport Community Band was reestablished in 1998 with 80+ members. The Band provides quality entertainment at concerts, community events and tri-state festivals. The Williamsport Community band has participated in the MD Festival of Community Bands and will be hosting the event in 2014. The band was honored when chosen to perform at the National Shrine of St. Elizabeth Ann Seton with the Metropolitan Detroit Chorale for the commemoration of the 150th Anniversary of the Battle of Gettysburg in June of 2013.
the Stone part of the Boy Scout Building. Williamsport Town Hall and stone walls around our town were constructed in the same era. 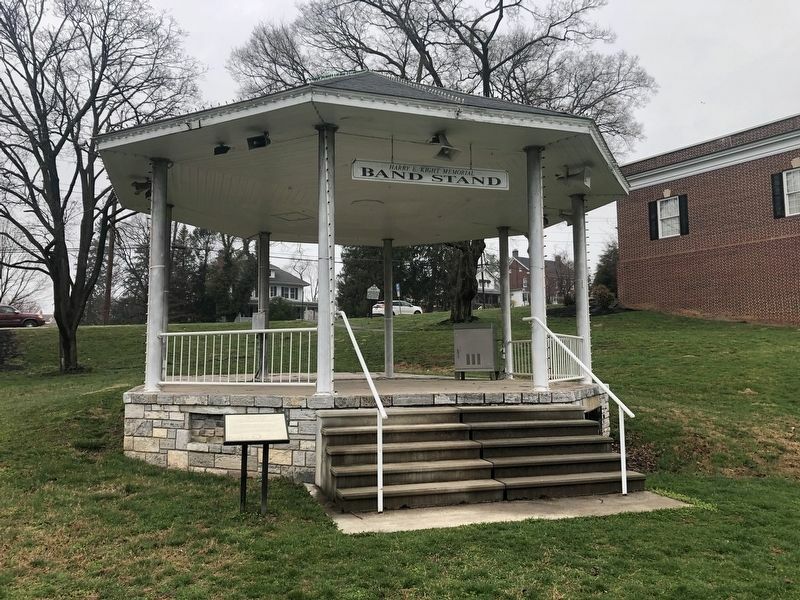 Erected by Community Band, Williamsport, Maryland. Location. 39° 36.021′ N, 77° 49.057′ W. Marker is in Williamsport, Maryland, in Washington County. Marker is on Park Road south of East Potomac Street (U.S. 11), on the left when traveling south. Touch for map. Marker is at or near this postal address: 104 East Potomac Street, Williamsport MD 21795, United States of America. Touch for directions. Other nearby markers. At least 8 other markers are within walking distance of this marker. The Wagon Train of the Wounded and Williamsport (within shouting distance of this marker); Boy Scout Troop 17, 100 Years Old (within shouting distance of this marker); Williamsport (within shouting distance of this marker); a different marker also named Williamsport (about 500 feet away, measured in a direct line); The Wagoner's Fight - July 6, 1863 (approx. 0.2 miles away); The Springfield Farm (approx. 0.2 miles away); Murder of Dewitt Clinton Rench (Rentch) (approx. 0.2 miles away); The John Brown Bell (approx. ¼ mile away). Touch for a list and map of all markers in Williamsport. More. Search the internet for Band Stand. Credits. This page was last revised on April 6, 2019. This page originally submitted on April 6, 2019, by Devry Becker Jones of Washington, District of Columbia. This page has been viewed 96 times since then. Photos: 1, 2. submitted on April 6, 2019, by Devry Becker Jones of Washington, District of Columbia.